Application – Control tension in wire that cuts metal. Replaces 433833 with no modifications. Was sold as a Kodak machine. Application – Tensions plate material. Application – Provides drag torque on 1/2 of a roller to maintain web straightness. Application – Holds chain connected to carriage & verticle axis stationary while pipe is being bent. Application – Tensions roll of labels, to be put on soda bottles, etc. Must be mounted with shafts horizontal. Also sold under Xerox name. Application – Feeding plate material in digital printing press. Application – Controls tension on roll. Hollow through-shaft for compressed air, to actuate chuck. Application – Apply torque to 35mm film bobbin, to determine the direction the film is wound inside the can. Application – Connects to the steering wheel. Application – Engages motor to belt that transports original paper document. Special low torque version, CC60-CTC-B, for small rolls & light tension, also available. Application – Machine winds web onto smaller rolls. The clutch drives the small roll, controlling tension. Rated torque = 30 lb.-in. Rated torque = 60 lb.-in. Voltage: 6, 12, 24 or 90 D.C.
Easy to use – The Span adjustment scales output current for small or larger brakes & clutches. The Placid Ind. follower arm or ultrasonic sensor connects to the supply for constant tension unwinding / rewinding applications. For large brakes & clutches or multilple smaller ones. Drag Torque 4 oz.-in. 1 oz.-in. Overhung Load 20 lbs. 2 lbs. Power Input . . . . . 15-30 VDC, 35 milliamps max. 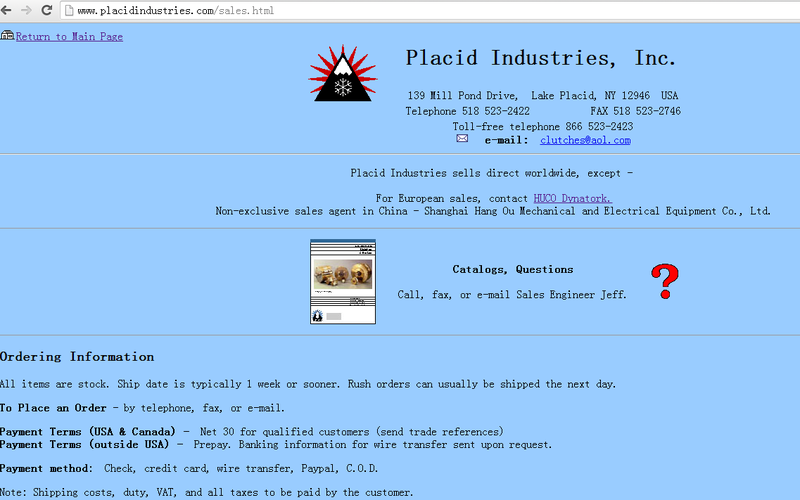 Powered by Placid Ind. power supply. Output . . . . . . . 0 to 10 volts D.C., 20 mAmps max. Protection class . . IP67 (Sealed plastic case) Download detailed set-up directions. KC & POC (large clutches) View large series of couplings. Models H11 thru H250 have the Placid Industries Cog-Buster which keeps slip torque smooth.